(Bloomberg) -- More consolidation in India’s struggling banking sector will help lenders lower costs and efficiently scale their operations, said researchers at the Reserve Bank of India. Labor cost efficiency, or output per employee, moderated across the sector between 2005-2018, according to the recently published paper. The authors added that state-run banks fared better than private rivals on this metric because they slowed hiring and adopted technology, while larger banks reaped the benefits of scale. “This finding provides an additional rationale for recent mergers of banks, both amongst public and private sector banks, and suggests that further avenues of consolidation in the banking sphere may be explored,” they wrote. 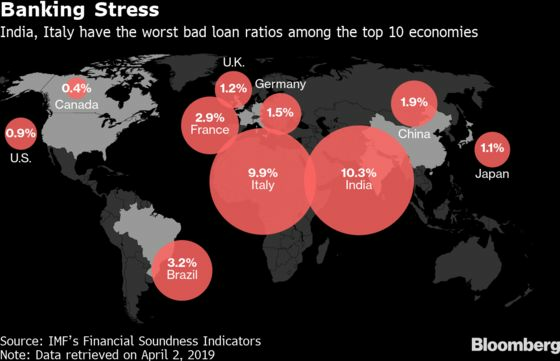 Mergers and bailouts have become a key policy tool in India, as lenders try to clean up one of the world’s biggest piles of bad loans after a credit spree went sour. State-run Bank of Baroda became the third-largest lender after it was merged with Dena Bank and Vijaya Bank earlier this month. Insurance giant, the Life Insurance Corporation of India, has also taken over IDBI Bank Ltd. as authorities threw a lifeline to the struggling lender.